Bathing my daughter has always been like trying to hold a fish. A fish covered in soapy suds that wriggles and laughs and runs away from you. While she loves the water and loves baths, both she and I have learnt that she is most certainly not a fish. I find even now that she is walking and understanding instructions, I still have both hands out whenever she has her bath – one to steady her, and the other to call the healthcare line to check how many times it’s okay for her to go underwater in the space of five minutes. So when I say that having the Moby baby bath would’ve made the first year of her life ten times less stressful, I’m really not exaggerating. Made by the award-winning brand Skip Hop, the Moby 3 stage bath is such a great solution to the stress of bathing babies. With a dual layered mesh sling that locks into two ergonomic positions (and can be removed as your bub gets bigger), the bath is designed to support your baby as they grow. Your forearms will be thanking the comfort sling which, in upper position, will hold and support your newborn head to toe. As well as giving them a comfortable bath experience, the security will also mean you can actually wash your baby instead of frantically trying to stop their face from going underwater. As they get bigger (3-8 months), the sling can be moved to lower position, which allows your bub to sit up with comfortable leg support. When your baby reaches nine months and is sitting comfortably on their own, the sling can be removed to give them more room to play safely in the non-slip base. With clever features and in a cute whale shaped design, this 3-stage baby bath is sure to make a splash. 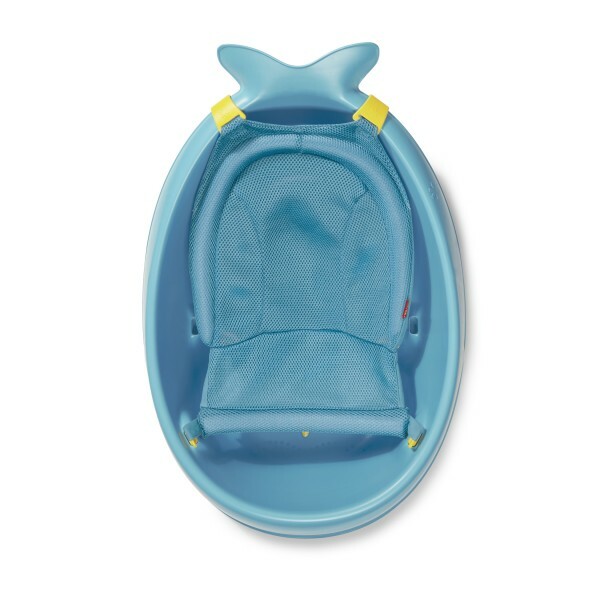 The Moby Tub is available for $79.99 through Baby Village.